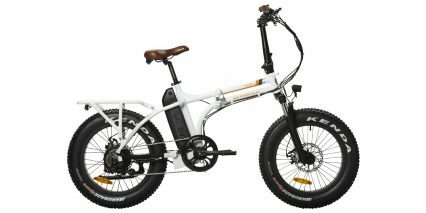 Kenda K-Rad All Purpos, 26" x 2.3"
The RadWagon is the second electric bicycle from Rad Power Bikes which started out with a fat ebike called the RadRover (crowdfunded through Indiegogo in early 2015) and has been working in the space since 2007. 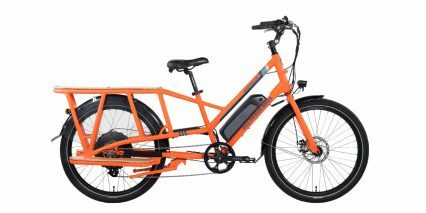 The Wagon emphasizes value and is one of the most affordable electric cargo bikes I’ve ever seen… To keep the price low a few components have been stepped down including the Shimano Tourney TX drivetrain, basic adjustable stem, independent rear light and cheap grips. 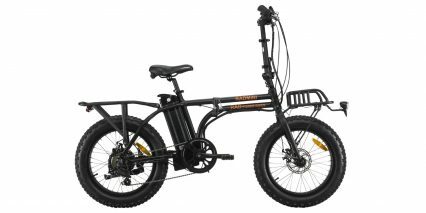 But where it counts, things are done right and there’s a lot to appreciate including wood platforms on the rack and running boards, full length fenders, front and rear lights, oversized 180 mm disc brakes and a sturdy double legged kickstand. 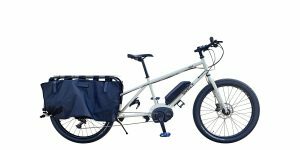 Compared with similar electric offerings from Yuba and Xtracycle the Rad Wagon is shorter in length and quite a bit heavier at ~75 lbs. 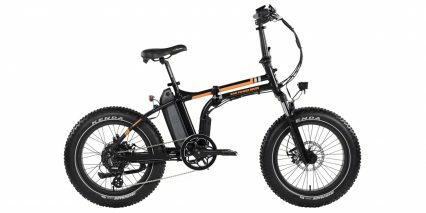 It’s built on a steel frame that helps to dampen vibration and features large Kenda tires and a Velo Plush saddle to smooth things out further. 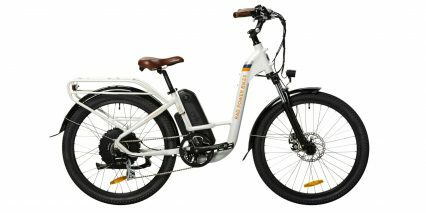 The most impressive aspect to me is the price… which is enabled through the “online only” sales model that Rad Power Bikes uses. 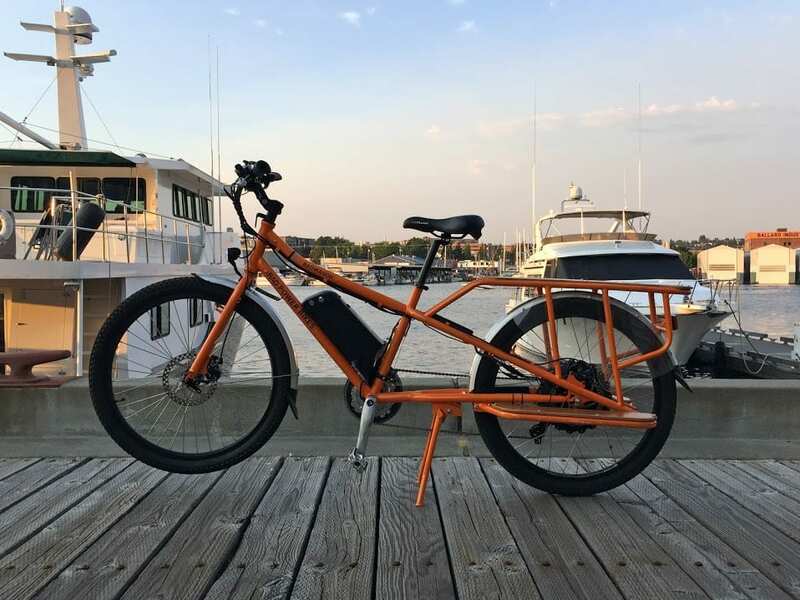 You will have to assemble parts of the bike on your own (or with the help of a shop) and cannot try it in person first which means the ~17″ frame may or may not fit your body perfectly (I’m ~5’9″ and it felt comfortable). You do get a one year warranty here and even though the company is relatively new I feel like they are well funded and operating in a professional manner. 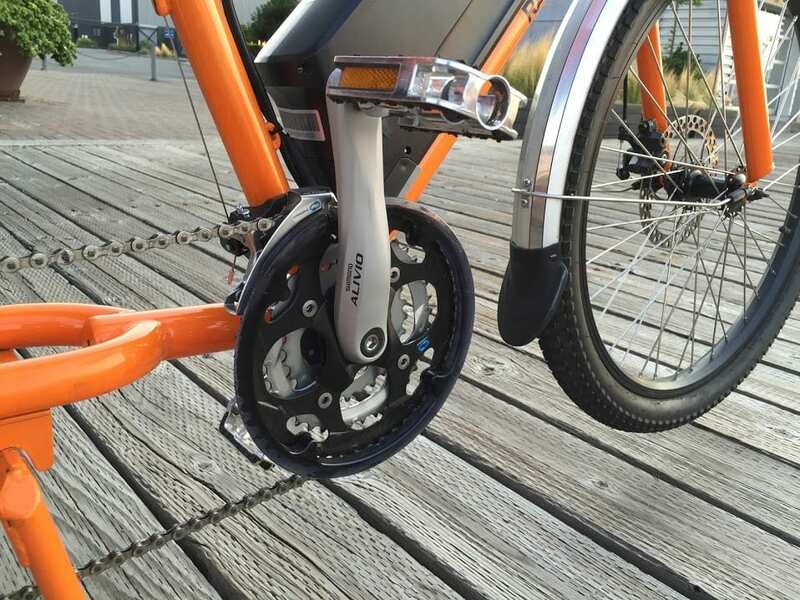 Driving the bike is a quiet and smooth 500 watt gearless hub motor. Not having gears, this motor is able to offer regeneration as well as power but it also weighs more and isn’t as strong at low speeds. 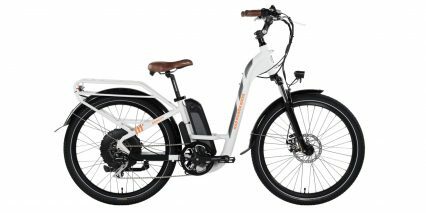 Many people ask “can you pedal an electric bike to charge it” but that’s not really the point here given the 10% to 15% efficiency. Basically, with a larger and heavier bike like this the regen feature just lets you save wear on your brake pads and extend range slightly if you’re coasting down hills for part of your ride. 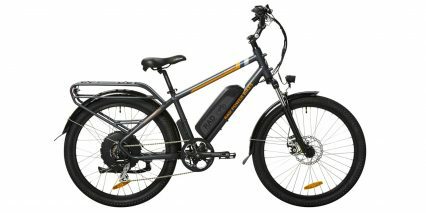 The top speed of the bike is ~20 mph and you can operate in either pedal assist or throttle mode. I love that there’s a throttle only setting (level zero) and that you can override assist at any time with full power using the twist throttle. You can also completely disable the throttle using the red on/off button near the right grip. I noticed a quick disconnect point in the wire running to the hub motor which will make tuneups and fixes easier but there’s no quick release back here… just in the front. 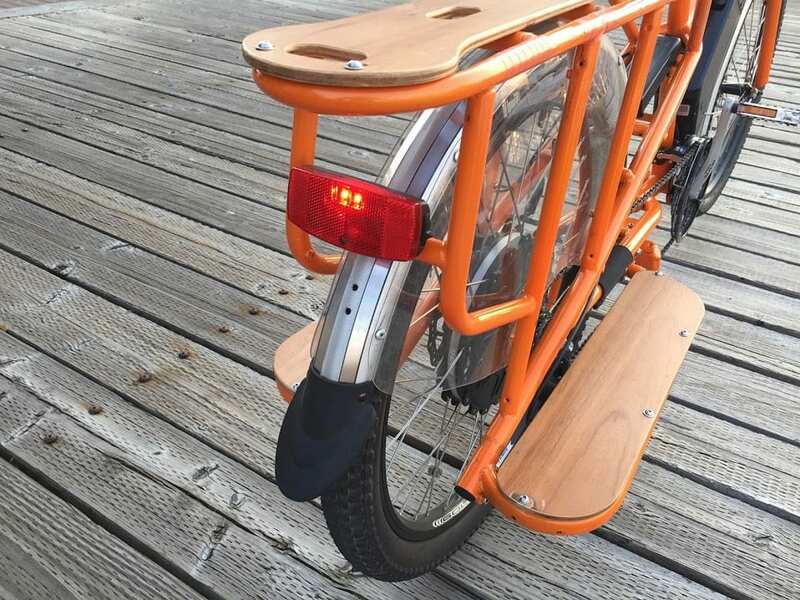 The bike uses a sine wave controller that puts out up to 20 Amps and controls power in a smooth way. 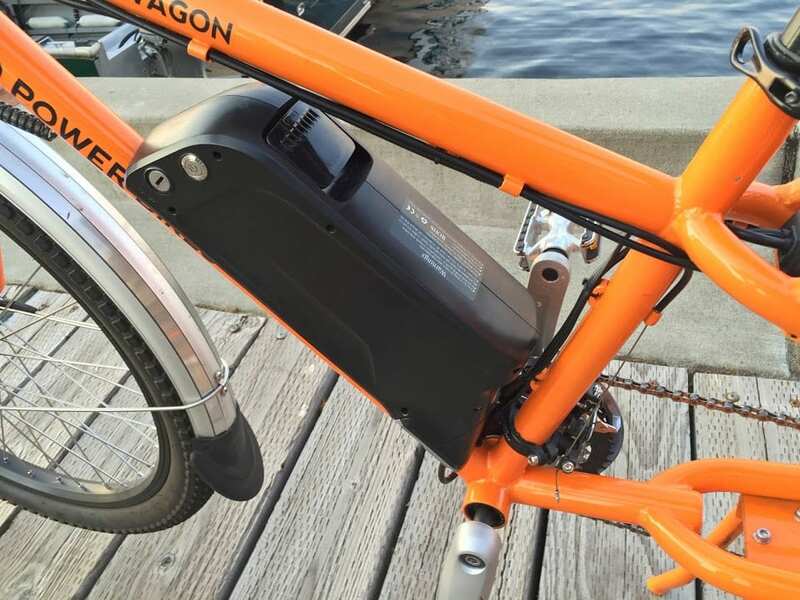 Powering the motor and front light on the RadWagon is a high quality 48 volt 11.6 amp hour battery. Inside are Samsung 29E cells that use a Lithium-ion chemistry aimed at being light weight and long lasting. To extend their life, store the pack in a cool dry location (avoid extreme heat and cold) and if you’re not going to be riding for a while leave the pack at ~50% instead of plugging it in. Check in on the battery every few months and fill it back up if power has been draining. I like the mounting location of the battery here because it’s out of the way and somewhat protected by the frame. 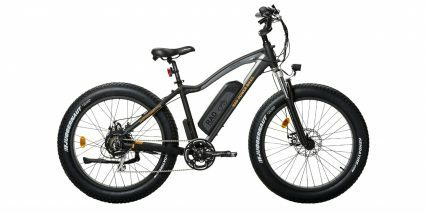 The pack weighs about seven pounds and that weight is kept low and center for improved handling and balance. 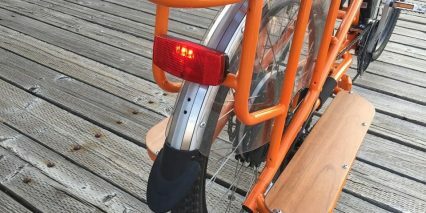 I did notice that when braking the rear tire can skid more frequently than on shorter non-cargo bikes because there’s less weight over the rear wheel. Getting back to the battery, one of the downsides I noticed is that you have to turn the pack on independent from the display console (so that’s two on/off steps). It’s not a huge deal but there is more potential for accidentally leaving the battery on which could drain its power. Same deal for the rear light, it’s independent from the main battery and runs on separate cells… if you turn it on but forget to turn it off while parking overnight you may come back to a non-functioning light in the morning. I would prefer that all systems run off of one main battery and that there be only one on/off switch to make it fast and easy but this design still gets the job done and saves money. 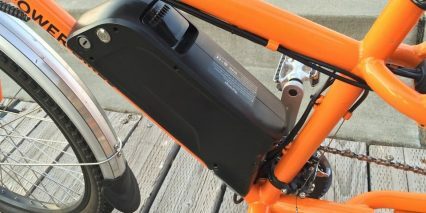 The battery casing is a generic “dolphin” style and the rear light doesn’t require extra wires as it would if it were integrated. Operating the bike requires a couple of extra steps but also includes some nice extras. 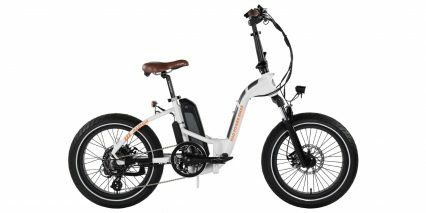 Once the battery is charged and locked to the downtube you press on and then on again at the button pad near the left grip. The LCD display comes to life and shows your power, assist level, speed and distance stats. At this point, you can hold mode to activate the headlight and then reach back to click the on/off switch for the tail light. At any point if you want to go, make sure the red button on the twist throttle is in and then twist! 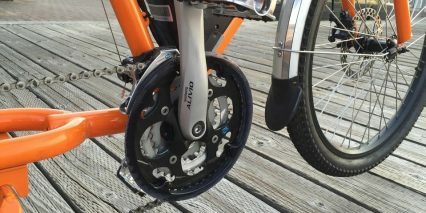 For improved range and a bit of exercise you can arrow up through five levels of assist and the 12 magnet cadence sensor (near the right crank arm) will sense movement and activate the motor. 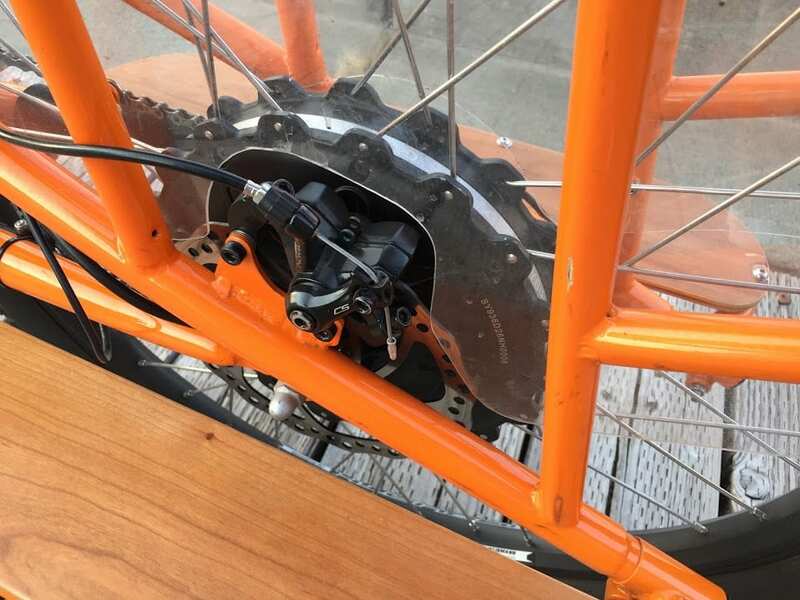 It’s great that they used a higher end cadence sensor because it’s very responsive but the brake levers are wired in to cut power to the motor so if you ever feel out of control just squeeze. 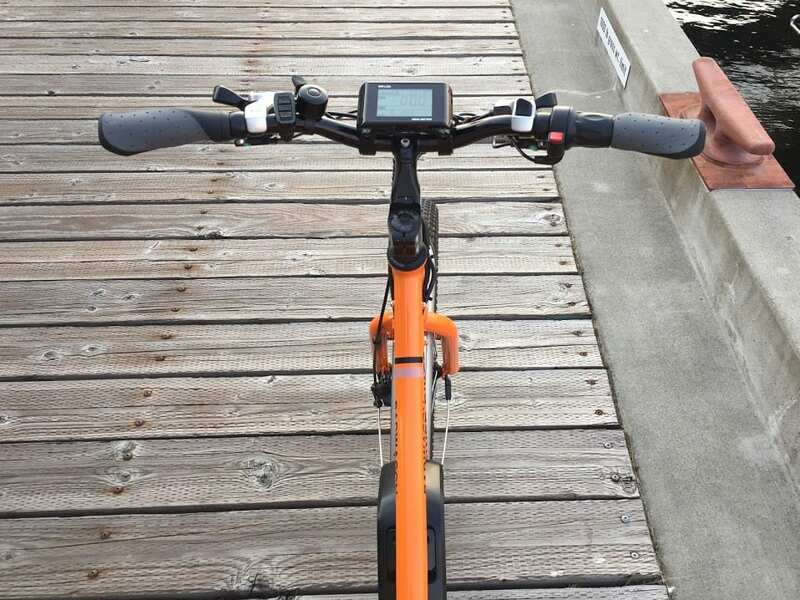 Another benefit to cadence sensing vs. torque on an e-bike like this is that you don’t have to push hard to get the motor going, it just listens for movement and then puts out the specified power and speed (low for level 1 and higher for level 5). I tend to ride in level two or three and then use the twist throttle for a boost of power when passing fellow cyclists or topping hills. Thanks for your review. You mention the bike should be compatible with some Yuba and ExtraCycle components. Do you know if specific components are compatible or if there is a resource for this information? Thanks for all the great review on your site, they are extremely helpful! I am interested to hear the reply about the accessories, in particular the Hooptie and/or Monkey Bars. I will purchase this bike if one of those options work. 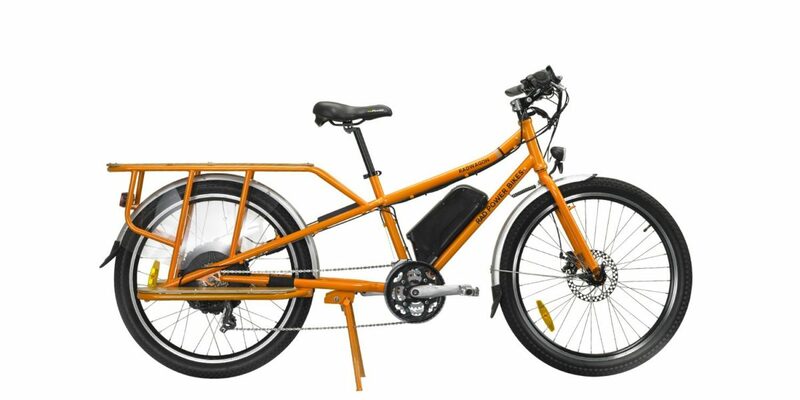 With a three year old I’ve been very interested in the “family style” options of cargo bikes with the rear decks, but have been put off by the price point of the assisted Xtracycle and Yuba. The RadWagon seems like it may be a great choice, but would love the added piece of mind the inner and outer rails of the Hooptie and Monkey Bars provide for kids on the back. I ordered my Rad Wagon accessories on line from the link above. I ordered the handlebars, breadbasket and padded seat. Hope this helps. I just googled accessories for Yuba Mundo and several sites appeared….Merry Christmas!!!! Do you know if anyone was able to retrofit the Monkey bars on this bike? ~Thanks! I bought the bars from the cambria site, but they are a bit longer than the back seat dimensions. We will have a great solution for this listed on our website for sale within the next 30 days. 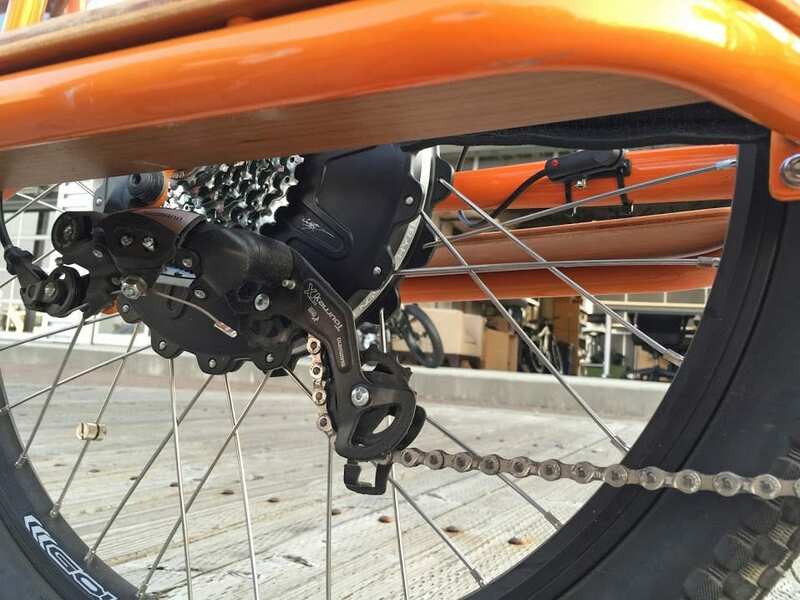 The length and mounting hole locations of the other accessories on the market make it challenging to install on the RadWagon, but we expect that you will really like what we will be offering, stay tuned, and thanks for the support! 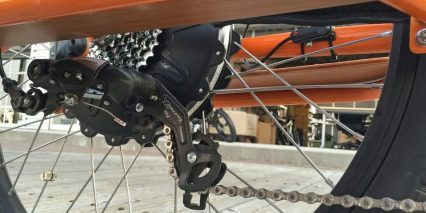 Radwagon owners, how is the bike holding up? Also, to the company–how long have you been in business? Are parts readily available? Tech support offered? Thanks. We have been in business since 2007 and replacement parts are readily available and stocked in our Seattle warehouse. We have an experienced tech support team ready to help as needed and we strive to provide same day responses as well as same day replacement part shipments if anything is needed on your end! My RadWagon experience so far. I have 1,500 miles on it since February, and I like it a lot. Motor has a lot of power. Me+bike+a bunch of gear = 400lbs, and I’ve yet to meet a hill I can’t climb. Speed is rated at 20mph, but you’ll get assist for a bit more than that. I can maintain 21mph+ for 10+ miles. You really can carry just about anything/everything you can think of. 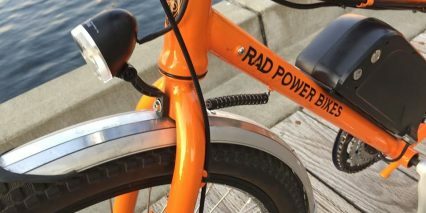 I love that RadPower doesn’t have proprietary batteries! 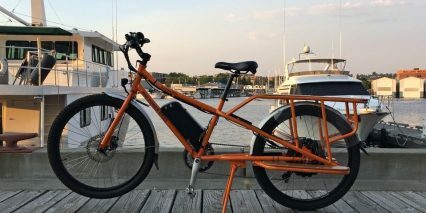 This means if you need another battery (my commute is long – one won’t get me there), you can get the most up-to-date cells at market prices, not 2-year old tech at a stiff markup, like most other ebike companies. RadPower’s light they sell separately is good, and I recommend it. Great price. Can’t be beat for the money. Beware the spokes. They use 12g spokes for durability. That’s good. Very few shops can cut or thread 12g spokes. That’s bad. And the ones that can, don’t stock them. When I broke mine, RadPower was out of spokes with no ETA, and the shop didn’t have any, so I had to order a box of them myself from Amazon. That’s fine I guess, but it sets you back a week waiting on them (2-day delivery wasn’t available). Also, the spokes get loose about every 300 miles. Finally after 1200 miles and 4 trips to the shop to have them tighten them (which I could have done myself, but was afraid to knock the wheel out of true), the shop recommended a full rear wheel rebuild. They rebuilt it with 13/14g spokes instead. Again, not the end of the world, but the bike was out of commission for an extended period. Invest in some kevlar tires. 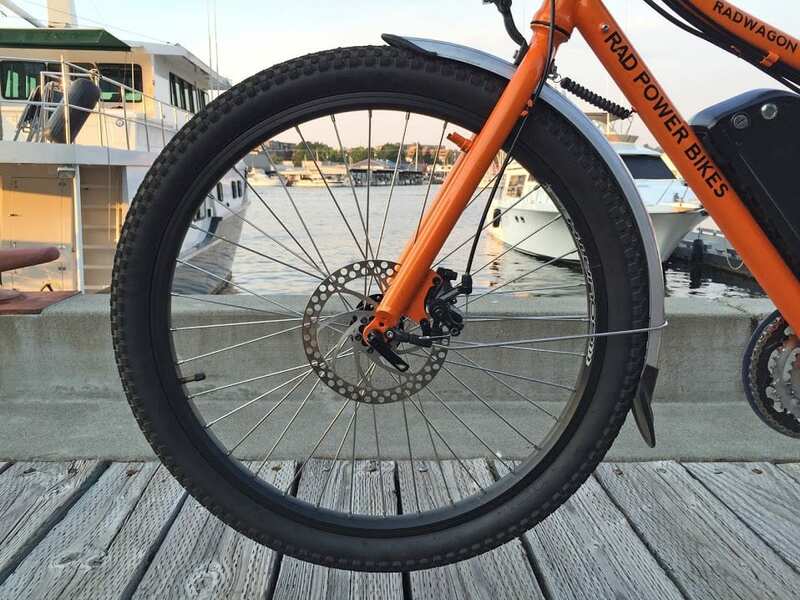 Non-kevlar tires + ebikes = nonsensical. My LBS isn’t all that happy when they see me coming. They don’t appreciate the 75lb weight, nor how difficult it is to get the rear wheel on/off. This is no fault of RadPower, just the nature of cargo bikes with hub motors. Their Ballard Bags are just ok. Don’t try using them without the runners, and don’t expect them to be waterproof. Decent enough for the price. Caveat Emptor on the cargo bike. 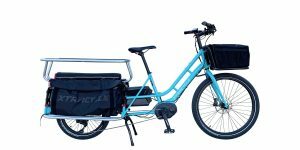 If you’re picking the Wagon, you no doubt understand the pros/cons of cargo bikes, but sometimes it’s a hassle. They’re hard to fit in cars, hard to buy racks for with the extended wheelbase, they don’t fit on bus bike racks. Excellent points, I enjoyed reading your cons and can relate to some of the difficulty working with shops (either for parts or just outside of their specialty). Most of the bikes I test are new so spokes aren’t loose but I have asked about this sort of thing before and heard that Loctite Blue can help to keep them secure. I hope the 13 and 14 gauge spokes hold up for you! I’m seriously considering the rad wagon as my first e-bike. Tested the spicy curry and a couple front boxes and loved them, big am balking at their price tag. On the other hand, I’m reading a few reviews that indicate that quality may be list due to the lower price. 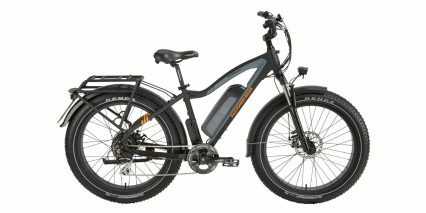 Given that I’m not an experienced bike person, how much maintenance will I be doing in this bike? How much more did you spend on the upgrades? I currently commute to work by bike and will now be adding a stop to drop off my son at preschool. It’s a total commute of four miles one way. In a perfect world, I don’t drive at all when in town. Thanks for any guidance you can provide. I’m really trying to make the right choice here. Oh yes, and finally, do you find it easy to keep the bike safe from theft? Purchased my bike 3 months ago and already logged in over 700 miles. Runs well and no issues yet. I was worried about the non standard spokes so purchased a few –just in case. Last week I was caught in a very heavy down pour 10 miles from home, soaked when I got home but bike ran without difficulty. I would buy it again. No regrets. Eventually, the electronics will fail. The company Rad may not exist by then. 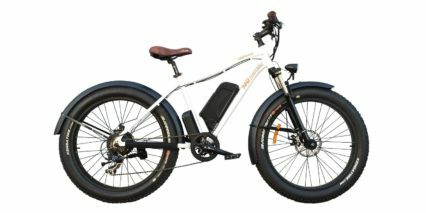 Will I end up having a non functional e-Bike? Are there any third party electronic controllers? I have now had my Radwagon for over a year. 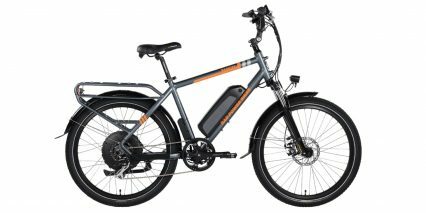 Overall I am pretty happy with the bike but as a learned more about e-bikes and about my own use, I have modified the bike to better fit my needs. I use the bike for commuting and for taking my kids (2 and 4) to daycare, a total distance of 7 miles each way. I also live on a very steep hill. I bought the aluminium accessory deck and the caboose to transport the kiddos. 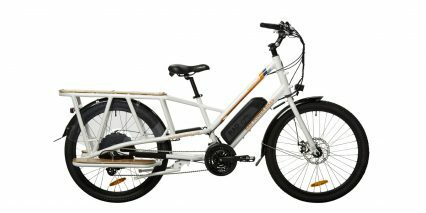 The bike works great as stock but it is limited in the amount of torque it can provide at low speeds, which meant that I could not get up the hill I live on with the two kids on board and I could just about manage with one and pedaling furiously. I have to say that the hill is beyond the specified capabilities of the bike, so this is not a ding on rad but rather a reality of where I live. Once on the not so hilly areas, the bike worked great and my kids absolutely loved riding in the back. 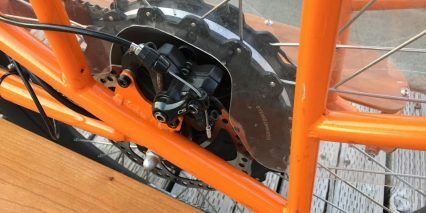 This issue with the hill made me look into possible modifications and I ended up mounting a mid drive motor (BBSHD) onto the frame, which was straightforward. I took out the rear wheel with motor and associated electronics and moved them only another bike. 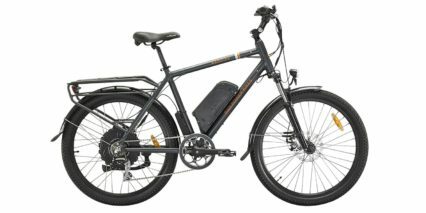 With the mid-drive motor, the radwagon frame is fantastic and works perfectly for my application. I like that it is just slightly longer than a normal bike and behaves in a very natural way. I use the motor as an assist and pedal all the time, so I appreciate that the bike behaves “normally”. The battery was plenty for my commute and back with either the original motor or the middrive, I never had any issue. As someone mentioned in one of the other comments, rad uses non-proprietary batteries so I was able to use my original battery with the new motor without any issues. Recently I also upgraded the stock handlebar to a Jones loop handlebar. Again, there was nothing fundamentally wrong with the original, I just find that I don’t particularly like straight handlebars and prefer a different geometry. I originally bought the Ballard cargo bags and I have to say they are just ok. One of them had 2 of the holding straps break off within the first few months. 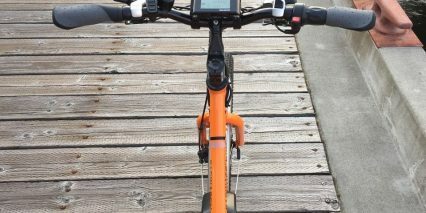 The way to mount them to the bike is also not very convenient if the deck is installed (which typically would be). I would not buy the bags again if given the opportunity. The caboose is very nice for carrying the kids. I just changed the nuts they provided with butterfly nuts so that it is easier to take on and off. Overall, I really like the frame of the bike and the fact that it is fundamentally a non-proprietary design, just a very sensible selection of parts that work well together. 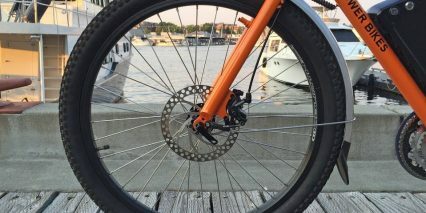 This meant that I started with a reasonably priced bike that works great and was able to slowly upgrade bits and pieces to customize it to my use case. 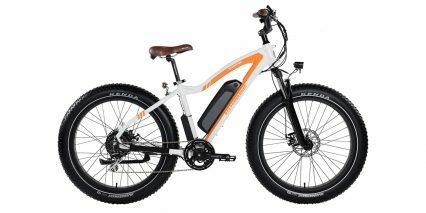 It is a shame rad does not offer this bike as a pure frameset as it makes for a great platform for a custom ebike. 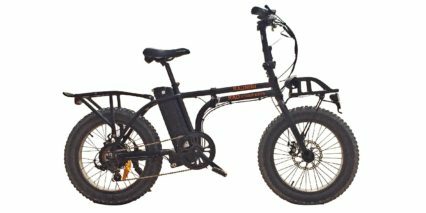 I’m 6’2″ — will the Radwagon be too small to ride comfortably? Court, I love this bike, it’s like a two wheel pickup truck! Those mtb handlebars have to go though. I’d rather have cruiser handlebars so I can ride sitting up straight. Next year when I get my tax refund I’m going to get one of these and cruiserize it. Only kink in the plan is I don’t see any slack in the wires and that will make populating the extra real estate on the longer bars very difficult. 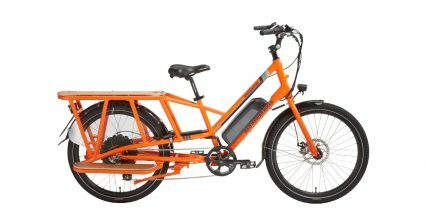 Can they add extra long wires and cables to accommodate different handle bars? 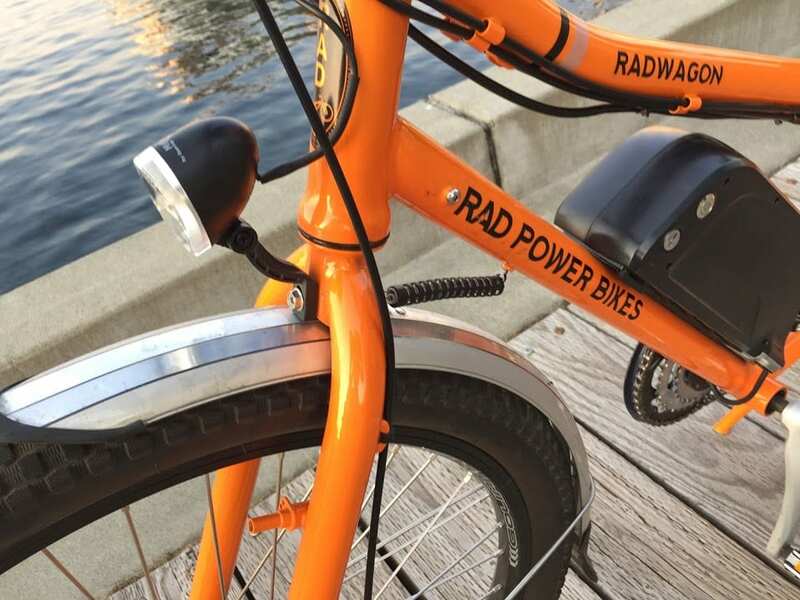 That’s a great question, Robert… Now that Rad Power Bikes has a retail outlet in Seattle Washington, I bet you could call and ask for some feedback and maybe even a customized version. I can’t say for sure, but maybe they would be able to adjust yours before shipping it out? The caboose on the radpower site has been out of stock for a while. 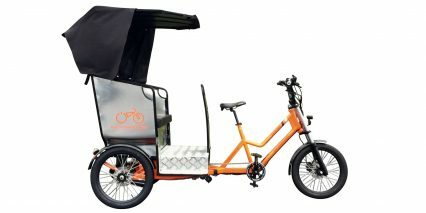 Does anyone know if the Yuba Mini Monkey Bars would mount on the radwagon? Great question Aaron, maybe this is something the folks at Yuba could help answer for you? 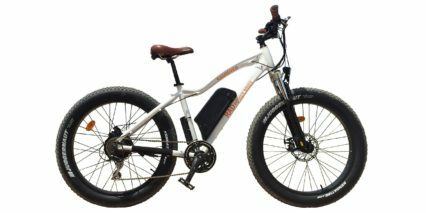 They sell an ebike too, called the Spicy Curry, and might be familiar with the RadWagon. I’m just going to go out on a limb here and say that I think they would be interchangeable, and you could probably return them if not… if you try it, please let us know!